• Obtaining funds from the government at present has become increasingly difficult, essential repairs and upgrades are being neglected. • Trying to organize an entire fundraising campaign can be daunting to say the least. Once formed, a committee must try to determine the most efficient and cost effective way of proceeding with the project, decide on structure, time-line, prizes, printing needs and costs, promotional equipment, student incentives, organizational requirements etc. • This often leads to a lengthy process and ultimately one that hasn’t fully maximized the situation, thus limiting potential income. • This is a common occurrence and shouldn’t be held against either the committee or the school itself, they are undertaking a project which they likely have minimal, if any, experience in organizing and one that requires precision planning & execution. • …and that’s where we come in, Midland Travel are experts in the field! • No deposit required. No massive outlay for the schools to incur like printing, design and acquiring prizes etc. 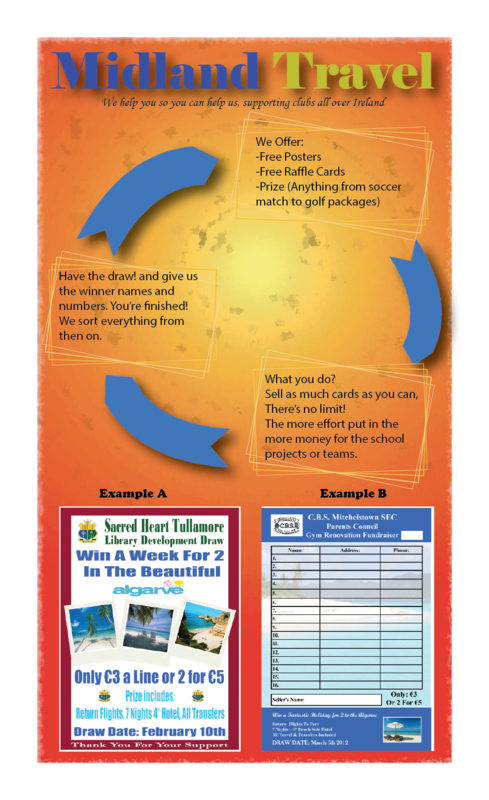 All prizes, draw cards, promotional material, student incentives, delivery costs & all other items which are needed to run the incentive are provided by midland travel. • It cannot be done any cheaper; the prizes alone are at almost cost price while printing and design can runanywhere upwards of €500. • We have a 100% records in generating new funds for organizations. Every single school that run a project with us made significant profit. • Experience, well established and Irish owned, fully bonded & licensed travel agents so as your draw is complete you pass on our details to the winners and you’re done! We take care of everything else. • Only one school in any area is given the opportunity to run the project so as to fully maximize its potential return.